Investment analysts and financial economists use various fundamental indicators to gauge the value of publicly traded equities. The calculation of these indicators is pretty straight forward: current stock prices are simply divided by the fundamental factor under consideration. The most widely recognized valuation indicators include the Price-to-Earnings or P/E ratio, Price-to-Book Value ratio, Enterprise Value-to-EBITDA, and Price-to-Sales ratio. The last ratio mentioned above, Price-to-Sales (P/S), is what intrigues me the most at the present time. As an equity analyst, the obvious advantage of using the P/S ratio is that it can be applied to stocks with negative earnings and cash flow which is frequently the case with younger, faster growing companies. Furthermore, sales are the least manipulated valuation indicator (granted, sales can be subject to aggressive revenue recognition, channel stuffing, etc). Earnings and book value are notoriously subject to manipulation and accounting shenanigans, but at the end of the day, a sale is a sale. 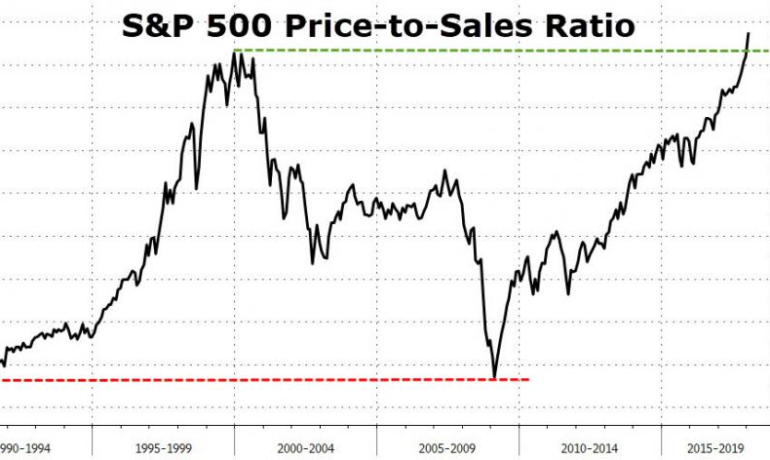 No single valuation indicator should be used in isolation, but if we look at the current P/S ratio on the S & P 500 all the bells and whistles should be going off. 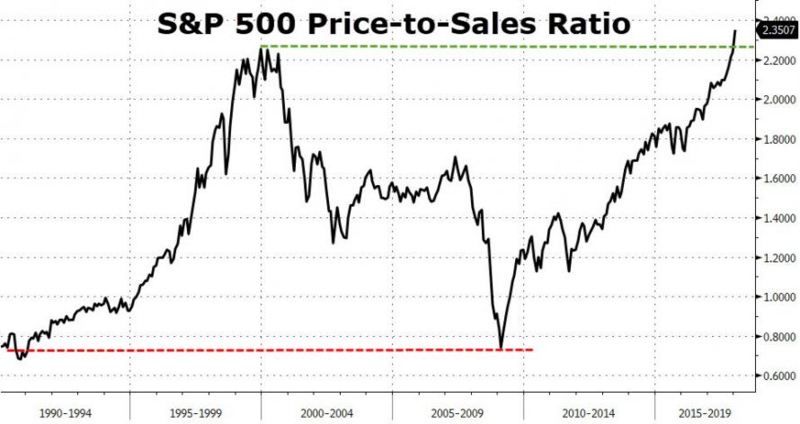 In fact, the P/S ratio has just surpassed the peak of the Dot.com era; the S & P 500 would subsequently go on to lose 45% in value, and the NASDAQ would fall approximately 80% in value before bottoming out in late 2002. Stock bulls would argue that “this time is different” and that an elevated P/S ratio is in fact justified and can be sustained for years to come. What are your thoughts? Is the S & P 500 P/S ratio pointing towards a bubble in equity prices or is “this time different” ? If you would like to track the S & P 500 P/S ratio through time on a quarterly basis, visit www.multpl.com. It is a great site with information on dozens of valuation metrics.